When you get employees to think like entrepreneurs, you get them to see the work they do from a different perspective. I have noticed this in my own business for years, and it has been confirmed in my work with Inc5000 leaders. Today I talk with a legend in leadership with a corporate perspective on leadership. 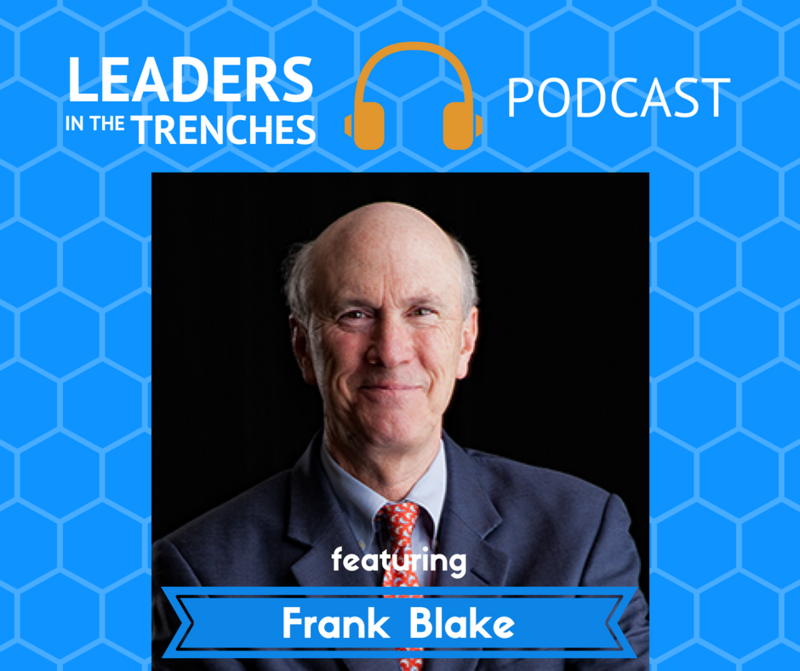 Frank Blake, retired CEO of The Home Depot, shares with me insights on leadership that can help anyone that wants to lead more effectively and to creates a sense of ownership amongst all levels of the company. Learn how Leadership that Activates the Entrepreneurial Mindset can change your organization no matter the size of it. Target Audience: Blake’s strategy has revolved around reinvigorating the stores and its service culture (engaging employees, making products readily available and exciting to customers, improving the store environment, and dominating the professional contracting business, an area in which Home Depot’s closest rivals trail far behind), as he recognized that employee morale is a more sensitive issue in retail compared to other industry sectors like manufacturing. Gene Hammett: Hi, my name is Gene Hammett. I’m the host of leaders in the trenches, and my question today is how important is the entrepreneur spirit inside your leadership? Meaning how are you activating people to think and act like entrepreneurs, but I hope that you think this is really important. I hope you think that when you get people to feel like owners inside the company and you’re activating that entrepreneur spirit, that they will take care of your business, that they will take care of your customers, they will grow the income and the profits of your business, and that’s what I’ve seen happening. I’ve got a very special guest today. It is Frank Blake. If you don’t know who Frank Blake is, let me give you a little bit of his resume and I’m not trying to give you everything he’s done, but this guy is impressive. Gene Hammett: Well, first of all, he was the former CEO of home depot from 2007 to 2015 if I’ve got those years right. He took over as ceo of Home Depot and before that he was at GE with under Jack Welch and under his mentorship as a leader and then before that he was working in government before that he was an attorney. No long list of things that he’s been through, but what we talked about today really strikes at the heart of your leadership about how you could activate others around you to feel like taking real ownership of the business and what that really means is willingness to take risk and really treat this. And a lot of this was learned from Jack Welch. You’ll see one of the important paths to success under Jack Welch was willing to go against his decision and against his, his, uh, ideas and then prove him wrong. That may sound odd, but he really appreciated the people that weren’t the yes men or yes women. He appreciated people that were willing to disagree with him and prove him wrong and show him a better way. That’s what got you promoted. So we talk with Frank Blake for a long time today. This is a very long interview. It might be a little bit spotty and some of the sound, but really hopefully you’ll take this in and really appreciate what I bring to you with Frank Blake, former CEO of home depot. Frank, how are you? Gene Hammett: Frank. I am a big fan. I first heard you on Andy Stanley’s leadership podcast. I know you showed up on a few other places. I’m going to let our audience hear straight from you because I’ve already told them a little bit about what you stand for, but tell us a about you and you know, what you’re doing right now. Frank Blake: So, I live in Atlanta. I was the CEO of Home Depot for eight years. A Home Depot is headquartered here in Atlanta, and I stepped down as chairman in 2015, but I’ve stayed in Atlanta. Both of my kids live here. I’ve got a five grandkids, so a very, very rude and they all live here in the Atlanta area. So very rooted in the Atlanta area. Uh, and since retiring from Home Depot doing some public company boards, I’m the chair, a nonexecutive Cherub Delta airlines on the macy’s and procter and gamble board and chair of this would be you would know at Jean being in the Atlanta area, but also chair of Grady hospital, which is the local safety net hospital for Atlanta. As busy as I want to be. Gene Hammett: Yeah, you are busy even in retirement. Um, when I thought about having you on the show and I tell this to a lot of times, so I’ll go ahead and tell her, tell the audience for listening in here. I named the show about people that are on the front lines, people that are leading their companies and are willing to get down there and get their hands dirty and lead from the front. And I heard you once say in an interview with Andy Stanley about, you know, how important it was for you to take some time to put on an orange apron and actually get in the store and actually serve customers. Why was that so important? Gene Hammett: so that’s in the trenches and I remember you saying specifically and I don’t know if you’ve got a story or two around that, but you know, some lady would turn to you and say, can you help me get this to my car? Yeah. You would actually take one. Frank Blake: Yeah. Many times. Many times the. Okay, best comment or maybe not the best comment, but the one I remember the most was towards the end. Someone, one of our customers saying to a cashier saying, Jay, does home depot have a new program with arp all guy out in the lot helping people. Gene Hammett: Yeah. That’s awesome. Well, let’s go back, you know, maybe back into the beginning because I know you, you, you came into a home depot through General Electric and you’ve had some time before that in, in the government area. So. And then before that you were an attorney and I probably missed some things in there. Is that about the big turning moments for you moments? Frank Blake: Yeah, I’ve definitely not a background that anybody would have said this person’s going to end up running a home depot. I started out life as a lawyer. I worked in Washington DC, had a very typical kind of Washington dc practice, uh, start my own law firm with a 11, 12 other people and went in and out of government. I would work for George Bush Dad when he was vice president. I was general counsel of EPA. Uh, I eventually was the deputy secretary of the Department of Energy in between. So I left a Washington that found Washington very frustrating and I left and went to Ge and worked in the GE power systems business as a lawyer. Long story, but ultimately transitioned on the business side. Ended up as a direct report to Jack Welch doing m and a for doing gs, a merger and acquisition work. Then came to home depot because the person who was running home depot at the time had also been at GE and I’ve worked with him. Then I became the CEO at the very start of 2007. Gene Hammett: Well, I appreciate those highlights because I guess I want to dive into this time with Jack because Jack is known as is a great leader and I’ve heard you say this before, but there’s so many facets to leadership, but when you were working with Jack, what did you learn about leadership? What does that one trait that was so important for leaders to, to embody? Frank Blake: So I’ll give a couple of answers and get her or, or a couple of traits. The first, the first trait is um, energy. So, and I am a deep believer in this, that one of the things that leaders, business leaders doesn’t matter the size of your business. If you’re the leader of the business, you need to be radiating energy. The organization feed off of your energy in a way which is why it’s such a draining job. Jack was an enormously high energy person. I describe it as when I was working for him, if he called. And those who, the days where you get many more phone calls and texts and things. When put in a phone call, I never took a call from Jack Welch sitting down. It was a reflexive I am standing up because this requires all my attention and focus because he is high energy on whatever that is at that time. Frank Blake: So that was the first thing that impressed me with Jack. The second thing that was really important is if you go back to that brief discussion we had on my background, I started as a lawyer at Ge. The reason I moved eventually was brought into the business side of it and and what I think Jack was brilliant at was Jack was brilliant at making people think that it your path to success and the company was to disagree with it and be right or wrong as a different problem, but your path to success was to disagree with them and be right. He would say, look, I don’t need to pay. A lot of people just tell me yes and I’m right. I want to tell. I want to be paying. People are telling me when I’m making art, my career, the reason I was promoted and move the business I was, there were instances where I disagreed with him. Frank Blake: I organization it feeds off of real discussion and real communication in front of the boss, the final commentary that I make on kind of character traits of leadership. What I learned from Jack was more an after the fact, but it made sense. So when I became the CEO of the Home Depot, uh, early on I put in a call to Jack that said, love reduced spend a day with me and kind of give me ceo one on one and just tell me your lessons learned. And he was very gracious and we spent a day and I then did that one day every year for the next eight years. I’d fly down to visit him, spend a day with him. I just can’t tell you the amount of stuff. I learned doing that the last year because it was the last year I’ve got. I’ve had this really sophomore question that I asked that I wouldn’t ask before because he kind of done that. Frank Blake: But I asked him, if you were to boil it all down and say, what’s the single most important leadership characteristic there is? What’s the single most important therapist? And his answer both shocked me and that it made sense as I read while in my own career and his answer was generosity. His answer was, and I expressed surprise because that wasn’t an obvious to me that that was what he was about, but his con comment was that as a leader, it doesn’t matter the size of the organization, what your organization is as the leader. You have to be fueled by the success of others. You have to be excited the success that others are making in your organization and if you are that not only will fuel them but pure yourself. And when I looked at my time at GE through that prism, I realized that his toughest he was, and he was a really tough leader. Frank Blake: As tough as he was, he was also really well when you did something right and when you know, when the time came to give a girl you was. That was part of his fuel. So long winded answer, but I learned an amazing amount. So when you were able to take that into your own time of CEO at home depot, how did it serve you through, through the growth of, of the, of the, the big organization that you hadn’t been used to? So the energy side of it. So the first part, the energy side, um, and again, I don’t think it matters what the size of the organization is. I talk about leaders or people who radiate out, they don’t absorb in and it’s exhausting and I know, um, that if, if you really take it seriously, that your job as a leader is to be a force multiplier within your organization is higher and you’ve gotta be very conscious about how you recharge your batteries and how you don’t take it all out on your family and all the rest of it. But it’s tired. It was absolutely the case with old people. That was an exhausting. It was an exhausting job. The second, uh, the second part about getting people to disagree and feel comfortable but disagree, Frank Blake: I’d, I’d say I’ve worked really hard on. I’m not sure I was ever as I. In fact, I can be quite positive. I wasn’t ever as good as Jack. Uh, and it’s very difficult. I tell leaders that they are, you know, the saying, you know, boil a frog whose slowly boiled frog, right? Saying I tell leaders that are the frog, that their organization is boiling because you don’t see it as a leader. What happens is that everybody starts to mold his or her opinion to yours that they, they think the path to success is to tell you what you want to hear. Bernie Marcus, the founder of Home Depot, had a great comment to me early on, uh, when I was CEO, he said, look, you’re going to find that when you’re sitting around the table with people who work for you, everybody’s going to laugh. Frank Blake: And he said, let me tell you, you’re not that funny, but that’s what the organization does. And it’s, it’s a constant effort to kind of break through that and get people to tell you what they really think. And again, I’d have to think that’s any group that is more than five is subject to that exact boss wants to hear until the boss, the boss. And then the final thing on the generosity. Uh, so now I can say this is, I put in the bucket of kind of keizer advice since I’m now a old can look back on my career. I tell people now what is the case that the things you’re going to be proudest of are the people whose careers that’s what you’re going to sit around and talk about and be proud of that it’s a, you know, I remember when so and so was, you know, a helpless, hopeless person and Yo put some investment in directed and now look at where they are and the. Sorry, I’m giving you these long winded answers. But one of the best moments to me, uh, actually being home depot ceo came afterwards, just recently here, sitting in a restaurant here in Atlanta and, and a store manager came up with his daughter and he said, I want my daughter to meet you because it’s because if you that she’s going to college. And you know, now that it’s not because of me, obviously there are a lot of other people, but that’s what you want. That’s the biggest payback for any job. Gene Hammett: So you probably not that familiar with my work and what I do, but one of the pieces, I wrote this book last year called the trap of success. Frank Blake: I love the title. Gene Hammett: Yeah, appreciate that. Um, it comes from a place of, I was in business, I was, I had about a $5,000,000 business and I wanted to do more, but I’ve got very complacent. I got complacent with the money. I got complacent with the time I had available to myself and I wouldn’t let myself grow. And I know a lot of people are like that. Now I’m in a different place where I’m looking for places to evolve and grow. How do you make sure that you never fell into a trap of success and continuously evolve? Frank? Gene Hammett: you came into home depot during a little bit of rough, rough patch there. It was 2007. Uh, it was right around the corner was 2008, which was the market fall out or was the housing crisis. How did you, how did you face that coming right into this huge organization leading all of these people and having this big disruption facing you? Gene Hammett: remind us of that. Maybe not everyone knows. Frank Blake: So great. One of Shakespeare’s great plays, Henry. The fifth is rallying the troops. Fighting a core and a very small number of British, some massive number of French, but to rally the troops in front of the battle, basically what he says is you are all so lucky to be in this most disadvantage stage because you will be able to claim the unique privilege of being here now before victory was certain and that will, you know, double the significance of victory when you achieve it. So, and I’m saying it very inelegantly, but I used to be able to do some version of the Henry the speech all the time. Gene Hammett: It reminds me, Frank, I was going to do a half marathon here in Atlanta. This was years ago and I’ve never done one before and I misread the start time so I would normally get there early. But I got there about, I guess about 30 minutes late and I actually went, my, my girlfriend drop me off a half a mile away from the start line. So I was walking up there and then I realized, Oh, I’m, everyone’s gone. Volunteers are gone, everyone’s gone. And um, when I went through that and I, I was running, I was actually so proud of myself because I saw my mom and dad [inaudible] this is the first time I’ve ever done one on peach tree street down by peachtree battle. So I was going down the hill and I said, see all these people, every one of them, I passed them all the way in the back and sometimes we, you know, we’ve got to remember, you know, the things that are going on inside us. So I’m going to ask you this question like how did you manage yourself going through this? Because I know a lot of leaders right now, they don’t take time for themselves. They put everything into the business. And how did you be able to really have the energy and have the thought to take care of yourself through all this? Frank Blake: Uh, so my answer is not a great answer. Uh, I’m not sure, uh, those around me would say I did it that well other than to say that. So I didn’t really have a recharge the battery or theory or resting and relaxation to recharge a for me. So I tell the story frequently. It’s not a good story about myself, but it was a great learning moment for me. So early on I tried to do a dinner every week or so with a Harley especially. So that’s why I was traveling somewhere. We get 14 to 16 hourly associates together and we’d have dinner parties here in Atlanta. We get 14 to 16 hourly associates. We’d have a. The first of the second one I did, I’m sitting next to a woman, you know, roughly my age. She asked me how’s everything going? And I said, oh, that’s great. But at the time my back was hurting. And so I said, ah, you know, my back’s already. And she said, Oh, tell me about a complaint about my back, blah, blah, blah. Now Mind you, I’m flying there on a company plane, staying at a really nice hotel. This is a first world problem. Even the front of my back. Frank Blake: And she said, wow, you know, my back’s hurting too. And I said, Oh, uh, you know, what happened? She, Ben Describes, you know, she fractured her spine or done something horrible while she was working in the store and she had to be working for a wheelchair and handling things like lumber and other heavy objects when you’re in a wheelchair is really difficult. So that was really hard. Period. The last three months, you know, she’s just out of the wheelchair. I’m, as she’s going on, I’m going, oh my gosh. And I was feeling sorry, a little tweak of a back. And I said, oh, that’s just horrible. And then she said, yeah, well that’s not the worst of it. And I said, oh, it’s worse, but what’s worse? And she said, well, you know, my, my 12 year old son is developmentally disabled and I have to pay them every night. And now he’s very large. I have to lift him in and out of the tub, but not really. And she’s going on about this. And I realized, um, I am so damn privileged if I complain at all in the time that I have a billable to me to run the home depot, shame on me. So I just looked at is comparatively a not much to ask. So I appreciate that story. Gene Hammett: When you were working and growing. Um, I noticed when I was in the store the other day I went to the restroom and one of the, um, on the wall was a circle that had the values of the company. I don’t know if you were involved with creating those were, were you involved with that? Frank Blake: So, no. The, my benefit was that the values on that value for real, they were established by the founders of the company and we talked a lot about them, but they were there. Well that I can appreciate that because I know that that sometimes happens. One of them stood out to me because I have seen this in my work because I, as I share with you frank, I work with hypergrowth company. So most of my clients and most of the, probably the people listening in here are either emerging into the inc $5,000 or have already received honors to be on that list so that the fastest growing companies out there, and one of the core principles that, that really drives them is the entrepreneur spirit. Right? And Home Depot has one of the slices of this will as entrepreneurs, how has that played out and important for Home Depot’s growth? Gene Hammett: that got you through this, you know, another one is, um, shared goals when you actually find the, what one person wants and how can you align that within their job to benefit the company and the person they spoke differently. So, um, when you, is there any stories that you can think of that kind of align with that entrepreneur spirit that you were home depot is really trying to inspire? Frank Blake: Well, I mean, there are lots, uh, and many of the great things that happened in the stores every day start because some entrepreneurial person in some stores started the idea and then it grew like wildfire because it was successful. Uh, so there, there are lots of those examples of just taking a risk and doing something. And seeing, seeing, grow within, within the business, retail in that way is, is a great business that the entrepreneurial spirit, because you can see what all your competitors are doing, you can see what your other colleagues are doing and you can figure out your own spin on how you can make that better. Gene Hammett: Well, I, I wanted to share that with you because that’s one of the core things that came out of fast growth companies. Um, now that you’re out of home depot, things are changing. What do you think is on the horizon or the evolution of leadership? Frank Blake: Uh, I think, I think first that increasingly people are looking at leaders too. I mean, I knew this was always true, but maybe it’s clearer now than it was always the case. But people are looking for leaders to invest in them. So I believe that’s the case, that people are understanding increasingly that they need to invest in their employees. If their employees are going to invest in them and they need to be thinking about making it clear. How do they make that clear to their employees that they are invested in their success and they care about their success are much, much more mobile workforce than we’ve ever had before. So it’s not as easy to hold on to people. And uh, I think that’s, as I say, I believe it’s always true that the best leaders have always shown that they invest, you know, it will always told their employees what they’re doing to help them, but I think it’s even more so now and empowering them to control their own lives. Gene Hammett: When you think about leadership and, and there’s two different schools of thought, put the customer first or put the employee first, where do you come down on that spectrum? Frank Blake: I think it’s, I think it’s kind of a false choice. I think they’re saying. Um, so, so the way I would put it is the customer at some point is, is foundational. No business exceeds unless it has a better answer for a customer problem than anybody else. So in that sense, the customer is at the root of it all because in the end you’re running off with the customer’s money. So don’t have customer money. Everything else can be going great, but doesn’t Matt in that sense, the customers first. But on the other hand, if you’re not treating your employees well, if you’re not taking care of your employees, why would you think in the long run or even the medium and short run, your employees will take care of your customers the way you want. And so there are some rare companies where their product is just so amazing that it doesn’t matter whether they’re employees are engaged or in different or whatever. But for most companies, if you want to provide that amazing customer experience, you’ve got to have engaged employees or associates who really buy into what the company is doing. So in that sense, I think it’s a false choice. But if you had to, if you had to make the choice in the end, everybody knew. Nothing happens without the customer. Gene Hammett: So the way I describe it, frank, and I could be wrong in this, but you’ve got to have be customer centric, but you’ve got to put the employees first and so the employee employees can know that you’re taking care of them and that they can put the customers first in their world. And it comes to that kind of cyclical circle and leadership is, is the, is the driving force that, that really shapes all that. One of my top articles for ink magazine is managers are a dying breed. What we need instead our leaders. Um, when you think about managers in your world and not going to talk about home depot or specifically because I know you’re still working with a lot of companies, what do you think is going on with, with the whole management versus leadership now in business? Frank Blake: Yeah. I think, uh, management, it’s all definitional, right? But you just take the word and you say manage is a function of controlling variables and you know, just kind of taking different output. That’s an inputs and managing those, uh, it probably never was that successful. It probably always required leadership. But it’s much, much clearer now in a fast paced a environment that’s changing rapidly, that if you’re just managing inputs and output, um, and not leading an organization through change, I think my guess is that that was actually true in the sixties. Just people didn’t think about it that way and they didn’t understand no. The people working I not to pick on the auto industry for a second for the people working at gm or Ford or whoever didn’t really understand the pace of change. Let me ask them. Yeah. It would be hard pressed to find business leaders now everywhere who don’t understand the pace of change coming from China, coming from online, from all of the different vectors of competition. So you know that if you’re just trying to manage outcomes, you stand no chance. You’ve got to be leading through change because everything is changing so rapidly. Gene Hammett: I totally understand how that such an important driver right now. When, when you are working with, with companies and you’re, are you still involved with m and a at all or. Gene Hammett: My first job ever was doing a lot of m and a work. I was right out of Georgia tech and I remember my boss said this, this company says it’s evaluations $150 million. Can you tell us if that’s true or not? Gene Hammett: And I looked at the prospectus and I’m like, it looks like a pretty solid company. And she’s like, yeah, but you need to find that the shadows and the and the, the snakes inside this company. And so I went out there and interviewed a bunch of companies to figure out was it really worth $150 million of the reality was. It wasn’t. But I wanted to ask you about, you know, looking at things today and maybe give you a chance to rant a little bit and I don’t want you to take that in a bad way, but what really irritates you about a business today? Is there anything specific factor that, that really kind of gets under your skin? Frank Blake: Not really. I mean, I’ll be honest, I don’t have rent. Uh, you know, there’s some people who rant about, you know, I got to meet quarterly numbers and no long term thinking, I actually don’t rant about that. I actually think if I’m in a public company and I’m asking shareholders for their money to invest in my company, if I were a reasonable person, I’d be telling them how I’m doing every few months. I’d be setting out milestones to give them confidence in the short term that I can do what I say I’m going to do in the longterm. So I don’t rant about that. I think companies particularly now have a, have a good anchoring in, in what they’re doing in their communities. You don’t see many companies that are disassociated from what’s happening in their communities that don’t take a stewardship view of what their role is with the community. Um, I think, you know, businesses changed an awful a lot in the last five decades that I’ve been around. So no, I don’t have a, don’t have a particular. Right. Gene Hammett: Well, I to give you a chance if you had one thing we haven’t talked about here in, and I heard this from another interview you did with Tim Ferriss around, you know, it’s one thing to measure the numbers, to really celebrate what we want to reinforce. Um, tell us a little bit more about why celebration within leadership is such an important piece of growth. Frank Blake: It’s my number one learning from my time at home depot. Number one, learning. I didn’t understand it before it started and I view this as if, if I learned anything at all, it was, you know, so you have the business saying that you get what you measure. I think as important are the corollary is you get what you celebrate and recognize and that companies aren’t nearly intentional about what they celebrate, of what you ought to do as a leader of any kind of leader, any group, you got to say, here’s where I want to move. Whatever your direction is, here’s the behavior that I want. When you see people well moving in that direction and that behavior recognized and celebrated because otherwise everything you do or otherwise you risk having what you say in other contexts. Just be abstract and the great thing about recognition and celebration is we get it. Frank Blake: We understand as human beings, if you go, Gosh, look at this amazing thing. Gene did a whole Gene up in front of my group around the table. I say, Jay, thank you for doing a, b, and c, and I give Gene whatever it is, the company, Lucky Penny. It doesn’t matter what it is, a Gene. Here’s the company. Lucky everybody else around the table goes up, boss wants really? Okay, well I can get the lucky penny. I don’t know. I do stuff like that all the time and so it reinforces the behavioral patterns that you want within an organization and my comment is you, you want to know what an organization does? Show me what an organization so okay, show me what they celebrate and I’ll tell you what’s important to that organization. Do they celebrate cost cutting? They celebrate innovation. Do they celebrate taking your risk? Making numbers, you tell me what the boss actually celebrating versus what he or she may think they celebrate, but show me what they actually are giving recognition and, and you know, lots for. And I’ll tell you what drives that organization. So we are not that complicated. Human beings are not that complicated. Tell us, you know, jump here and everybody’s going the clap and applaud, jump, jump here. And everybody got out. Okay. That was fast. You know, we won’t care so much about just the way they are. Gene Hammett: Well I will tell you when I was doing some research with the hypergrowth companies I talked about before, we talked about innovation a lot and you know, a couple of the companies said, you know, we love to celebrate failure. And I said, well how do you celebrate failure? And they said, well, you know, at the end of the year we have these award banquets where we celebrate success, but we, we pick one team to recognize is a failure that led to a breakthrough. Gene Hammett: And it could be a small failure, could be a really big failure. We’re not asking them to take, you know, uncalculated risk, but what did it lead to the breakthrough, and I’m. Frank Blake: Does that surprise you? No, that’s exactly right. And again, I go back to Bernie Marcus, the founders of Home Depot, and that was one of the things he said to me, said, make sure you celebrate failures because to your comment on the entrepreneurial spirit, you can’t have entrepreneurial spirit without failure, so if you don’t, if you don’t take the time to do just what you said, jeans all somebody up and say, this was great. This was a noble failure. Everybody else has done it. Internalize. Oh, okay. Well, you know, they might say entrepreneurial spirit. They’re really saying is entrepreneurial spirit that works well. Entrepreneurial Spirit. That work is not an entrepreneurial spirit, right? I mean you don’t. It’s entrepreneurial because you don’t know are you going to succeed or fail? Fired if you fail, and they. Everybody. I mean, that’s why I say the disconnect that organizations have around what they think they’re encouraging within actually charge are profound because you can have somebody say all the words but entrepreneurial risk taking and all the rest of that, but if what they recognize and celebrate are all down the road, middle of the road successes, are they going to be surprised that they never seen anybody take a risk? Frank Blake: They shouldn’t be. Frank Blake: so the one practical step is, uh, and this kind of depends on the size of the organization, but I’m a real believer in travel time. So, uh, take someone, whoever it is a from your organization and travel for a day. No, there’s no place to go, no place to run, no place to hide, no escape. You’re in the car, you’re in the plane, wherever it is you’re going. And it gives shoe a real. I mean, you know, meetings are okay, but meetings tend to evolve. Lots of people, they get very political. People are very guarded about what they say and they don’t say get away with something wholesome and you know, have that lunch in a strange place. Have the conversation as you’re driving along. No, what it is you want to ask about. And I mean being intentional about it, so just don’t randomly go off and travel. But those were almost always my best meetings I’ve learned the most and it wouldn’t be necessarily at the first half hour out because everybody first half hour, hour by the day guards down, they’re talking to you about what they really care about, what they think is going well, what they don’t think is going well. What I mean. So I’m a big fan on a practical level of spend a day with someone, just spend the whole day. Gene Hammett: I love that because it’s easy enough for us to do and to make sure we don’t squander that opportunity because some people won’t, won’t actually have the conversations. Maybe they’ll spend most of their time on their phone instead of actually connecting with someone. Frank, we’re going to wrap this up. I really appreciate you being here at leaders. Gene Hammett: Fantastic, crazy good turns. Frank, thanks for being here and sharing your wisdom. Frank Blake: Thank you Gene. Really, really enjoyed it. Thanks very much. Gene Hammett: Alright, fantastic. Interview with Frank. I just so love what I do. I know I say this all the time, but he is someone I looked up to. 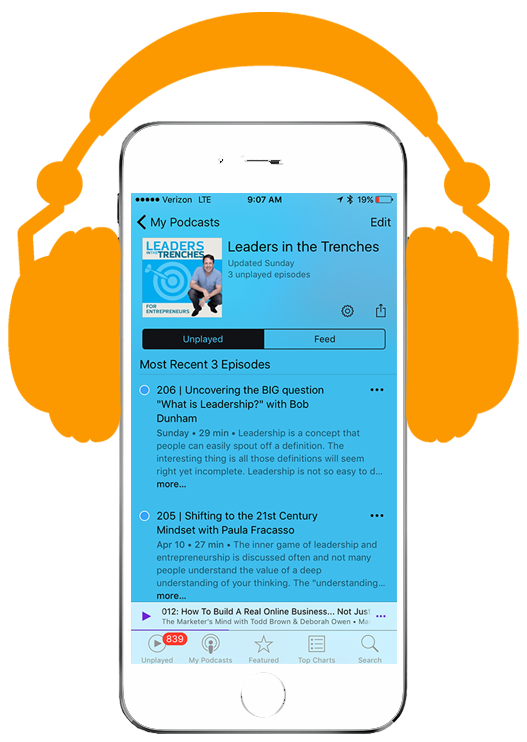 He’s been on a handful of other podcasts, is a really big get for my show to be able to share his thoughts about leadership and about what’s moving forward. Hopefully you’re building a culture of growth and if you haven’t taken the growth culture scorecard, make sure you do that. Just go to www.genehammett.com/culture and you’ll be able to see where you stand and have a real conversation around where are the gaps in your organization and how do you move forward to create a growth culture. Gene Hammett: Well, that’s my piece today. Hopefully you’ve enjoyed this episode and joy. The next one that we’re going to be coming together because we’ve got a huge lineup of guests coming and as always lead with courage and I’ll see you next time.